Similar to my PS2 i-link, I've now got 2 softmodded XBOX 180's each with 120G Hard Drives. Been concentrating on installing games with "co-op" modes like the Splinter Cell and Rainbow Six 3 games, and Star Wars Battlefront 2 (shown below). Will also be nice to race TOCA Race Driver 3 head-to-head at 60fps unlike split screen at 30fps. I'll be moving these over to 21" CRT's. These biggies are my lightgun setup. Currently have 30-32 games installed. All of them originate from legitimate retail copies I bought over the years. Great thing about the XBOX 180 is that you can pick up some great titles for less than £1. Still looking to get Brute Force and Heroes Of The Pacific. I also have a 3rd softmodded XBOX 180 that I'll be using for my single player games. Need a replacement lens and a 300G hard drive first! Thanks for replying. In terms of Japanese titles I have Panzer Dragoon Orta, JSR Future and also the Otogi games. Indeed most XBOX games are western-centric and it would have been great to have more but I have more than enough PS2 and DC games to make up for it. I'm not worried about console design (although the PDO skin is awesome) but then again I have a kitchen with green walls and blue tiles! I got a 360 recently, and rather than buy a bunch of 360 games, I'm actually going back and getting many original xbox games (keeping in mind the compatibility list). Too bad i'll never be able to play Gunvalkyrie on it though, it would have been great to play every sega offering available on the xbox. 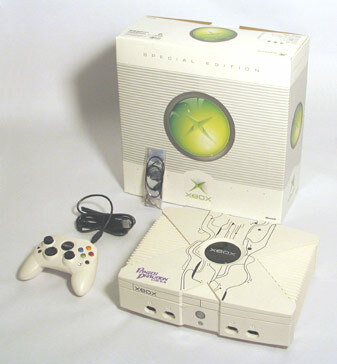 rjay63 wrote: I also have a 3rd softmodded original XBOX that I'll be using for my single player games. Well one of my system link XBOXs died today. I thought it was a capacitor issue as some of them were "bulging" when I looked inside, however it still didn't work after I'd replaced them. Turned out it was a hard drive failure so it's now useless. I guess breakdowns go with the territory but at least it'll be easy to replace. Since posting in this thread a couple years ago I sold my 360 and bought an original xbox. Don't miss the 360 much and I'm having a blast with the og xbox. Quite an underrated and cheap system to buy for atm, maybe we'll see a large uptick in console/game prices for this system in another 10 years. Dreamcast Games you play Online: Phantasy Star Online, Sonic Adventure, Sonic Adventure 2. Plan to play more. You should use XLink Kai, you can play Online games using it. It tricks your Xbox into using System Link/LAN modes in games and you actually get to play online with others. Halo, and lots of other games are supported. Works with PS2, as well and many other consoles like 360.